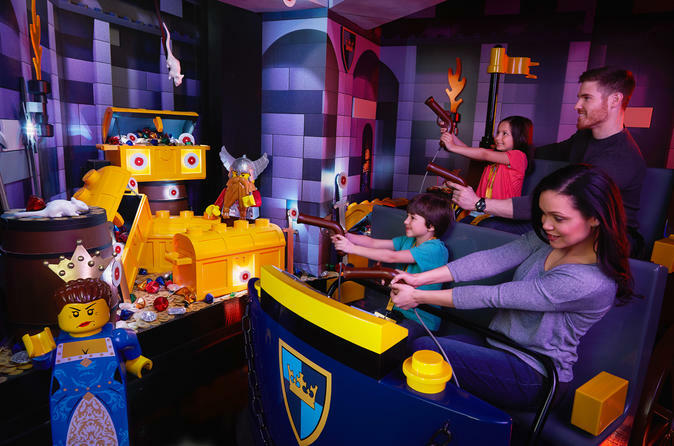 Use your admission ticket to LEGOLAND Discovery Center Atlanta anytime during open hours, and let your children experience the full range of activities at their own pace. The typical visit takes 2 to 3 hours, but you're welcome to stay as long as you like. Learn how LEGO bricks are made on the factory tour. Feel wind and rain during the four 15-minute 4D movies featuring popular LEGO characters. Use lasers to protect a princess during the Kingdom's Quest Ride, and pedal to lift your seat off the ground in the Merlin's Apprentice Ride. See LEGO models of famous Atlanta attractions such as Turner Field and the Varsity in Miniland, which features beautifully constructed buildings using almost 1.5 Lego million bricks. Let your children enjoy soft play areas and pick up Lego tips at the Master Builder Academy. Stop by the gift shop to see the latest LEGO building sets, and snack on sandwiches, Dippin Dots and other bites at the cafe. Your little LEGO lover can keep exploring until 7pm most of the week and 9pm on Saturdays.